Skulk is a really fabulous, exciting YA fantasy. Teenager Meg encounters a shape-shifting fox just as it is dying. It gives Meg a gemstone to keep safe. But it also gives Meg its powers of shifting and suddenly Meg’s life is very, very different. Meg learns that there are a series of shifters, but only a limited number (six) of each. When one dies, its powers of shifting transfer to the nearest human. Meg is one of six shifting foxes. Their group name is “Skulk.” There are also butterflies (the Rabble), rats (the Horde), spiders (the Cluster), and ravens (the Conspiracy). Each group has a unique stone belonging to them and Meg assumes that the one she’s been given belongs to the Skulk. Except it doesn’t. Meg is chased by a wall of fog, and when she sees a member of the Cluster get caught in the fog and die a horrible, painful death, she realizes that perhaps the only chance she has is to get the different factions to work together. But this is going to prove challenging. Even members of the Skulk don’t get along. What chance do they have trying to work with different shifters? And as if things weren’t complicated enough, the evil woman behind the killer fog, who is taking the stones from the groups, has created her own army of killer pigeons and Meg’s mother and father are two of the people the woman has converted to her avian army. Author Rosie Best has done a marvelous job of creating a character in Meg that is very likable, bright, and eager. While there are some things gone horribly wrong in her life, she doesn’t spend her time dwelling on the bad, or allow herself to fall into a depression. Instead she picks herself up and meets the challenges face on. This is a refreshing change from most female, YA protagonists! In addition to Meg, we also have a diverse cast of characters rounding out the story, and I mean ‘diverse’ in multiple senses of the word.. It’s nice to see an author making use of this larger cast of characters to make some social commentary for our younger readers. But I think what I liked best of all, was the set-up. The world-building here is incredible. ‘Shifters’ have been around for a while, but the rules that apply here, and the animals used is really unique and creates a number of questions that we hope will be answered in time. The action is nearly non-stop, and there’s even the hint of a romance, but Best doesn’t dwell on it (nor does Meg), but instead it seems to be just the right amount of tease for the reader. If anything, the book moves too fast, hardly allowing the reader to breathe or to catch up to what’s happening, but I would take this over slow any day. I see that there is a second book out, which I will seek out. It’s too bad Angry Robot (publisher) discontinued their Strange Chemistry YA line of books. I hope someone else will pick up this series and publish the entire set. Looking for a good book? 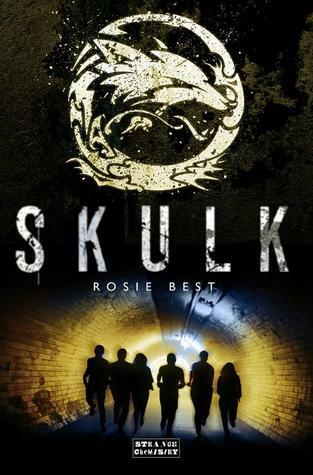 Skulk, by Rosie Best, is a fast-paced, original (and at times frightening) YA fantasy novel that you should enjoy.